Venerable Tana Tulku Pema Rinpoche is the present Abbot and lineage holder of Tana Monastery India, He was born in Hung Kara Saint lineage, one of the master of Guru Rinpoche. Not long after he was born the late 16th Karmapa, His Holiness Rangjung Rigpe Dorjee recognized him as a Tulku and gave him the name, Karma Ngawang Chokyi Wangchuk Palsangpo. During his earlier years he received most of the empowerments, transmissions and explanation of the Nyingma tradition from the late Dilgo Khentse Rinpoche, late Penor Rinpoche and Abbots in Nyagyur Shedra. 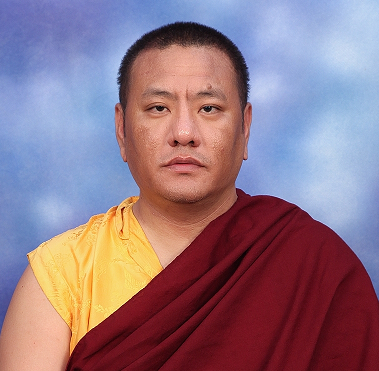 Rinpoche has received the Kagyu teachings and empowerments, transmissions from the Four Regents and studied at the Karma Shri Nalanda Buddhist Institute under the guidance of Kagyu Khenpos in Rumtek. Rinpoche resides in Tana Monastery, India and tirelessly travels widely and teaches abroad. Rinpoche underwent his permanent retreat at Sherabling retreat centre ‘Tingzin Gephel Ling’ under the tutelage of HH Tai Situpa Rinpoche, Venerable Yongey Mingyur Rinpoche and retreat master and returned to the Tana Monastery in March 2014. “May a Pureland be established that is reachable by ordinary sentient beings of impure karma, beings of karmic evil, who have not abandoned non-virtue”. As opposed to other purelands, the process of accumulating merit and wisdom is very rapid in Amitabha Pureland. 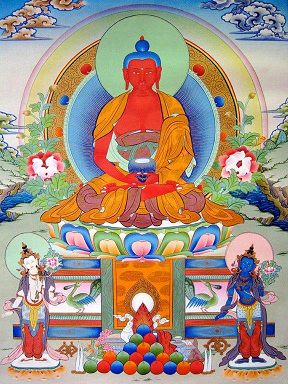 Buddha Shakyamuni himself said: “Therefore to pray to be reborn in Dewachen accumulates as much merit as if you were to offer the 7 types of jewels and other precious substances filling the 3,000 fold world systems.” The practice of Amitabha Buddha and its Pureland is geared to ordinary people. Anyone can engage in this practice due to the vows of Amitabha Buddha. Even for great sinners, if they practice strongly, it is possible for them to even attain rebirth in Amitabha Pureland. The way to take rebirth in Amitabha Pureland is to formulate a great faith and aspiration concerning the Pureland and have a desire to be born there. By so doing, one can accomplish the transference of one’s own consciousness to Amitabha Pureland. (The cost is inclusive of accommodation, breakfast, lunch and tea, translator’s costs and printing of texts and offerings to Main shrine). 3) Personal toiletries, (only toilet paper is provided in the rooms) towels, warm clothing, light sweater, flash light and socks. 4) Flask for hot water available from the hot water dispenser on every floor. 5) Sitting cushions are available and you need not bring any unless you are used to your own. The sitting cushions available are the step up types and made from coconut husk. So, they are a bit firm compared to the foam cushions. 6) Chin Swee Temple is quite cold during early morning and night. Those who are afraid of the cold should bring extra warm clothing. Under normal conditions, the weather is pleasantly cool. Please arrange your own transport to Genting Highlands. Suggest car pooling, although there are ample under-ground parking available at Chin Swee Caves Temple. Full payment to be made latest by 20 August 2015.